How Strong Is That Carabiner? The kN, or kilonewton, measures the amount of force the carabiner can accept, as opposed to how much mass it can hold in a static situation. Objects with relatively low mass (like a person) can generate substantial energy (force) when accelerating, so it can be misleading if a piece of climbing or fall-arrest equipment were rated in terms of pounds or kilograms. In order to convert kilonewtons into pounds-of-force (another measure of force, not mass), simply multiply the rating in kN by 224.8 (1kN = 224.8 lbf). 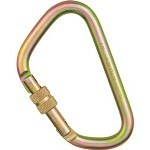 All Omega Pacific carabiners are stamped with the major axis strength measured in kilonewtons. Built as the new workhorse for Fire, Industrial, Rescue, Safety and Tactical industries, the G-FIRST is the world's lightest carabiner to earn the full-strength, “General” rating from the National Fire Protection Association! Rated to 40kN, this 'biner weighs only 4.6 oz—almost 10% lighter than other G-Rated aluminum 'biners and less than half the weight of steel carabiners. G-FIRST is ISO Cold Forged from aircraft-quality, heat-treated aluminum. Get them in all-purpose bright, Rescue Red or Covert Black. Whether you're fighting fires, working at height, saving lives or in a combat zone, the G-FIRST has you covered. 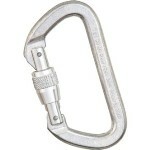 Small and light, this UL-Classified carabiner is the proper choice for all light-duty applications and for personal use. 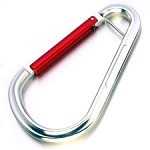 This NFPA carabiner is available in bright or black with a screwgate locking mechanism. You’re looking at one of the strongest aluminum carabiners in the world. At 31kN, it’s wicked strong and represents the most durable design in basic, functional climbing biners. You’re looking at one of the strongest aluminum carabiners in the world. At 31kN, it’s wicked-strong and represents the most durable design in basic, functional climbing carabiners. Through ISO Cold Forging, Omega Pacific puts material exactly where it will render the strongest design possible for a carabiner of its size and materials. 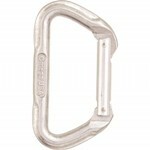 A new extra large D shape carabiner by Omega pacific. Massive gate opening clearance and super strong 1/2" steel frame. NFPA. 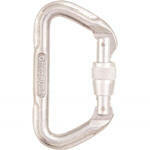 Omega Pacific carabiners are designed and tested specifically for fire, rescue, industrial and technical rope work. The user is responsible for following NFPA, OSHA, ANSI and all other applicable state and federal regulations regarding the use of these products. All of these activities are inherently dangerous and present the risk of SERIOUS INJURY and/or DEATH. The product information contained in catalogs and brochures is not a substitute for qualified personal instruction. Any person using Omega Pacific products is responsible for obtaining qualified instruction on the proper use, techniques and limitations involved in such use. Inspect all equipment before each use and destroy any gear that is damaged, worn or does not pass inspection. Any person using Omega Pacific products is responsible for the proper care and maintenance of these products. IMPROPER USE, ABUSE AND/OR LACK OF PROPER MAINTENANCE WILL INCREASE THE RISK OF SERIOUS INJURY OR DEATH. Any person using Omega Pacific products in any manner assumes all risks and accepts full responsibility for any damage or injury, including death, which may result from the use of any Omega Pacific product. Any litigation involving this product will be in Washington State pursuant to Washington law. 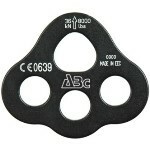 ABC alloy mini rigging plate is light and small for easy transport. Keep your rigging clean and organized in any situation. Individually tested. For liability reasons and your safety... We cannot accept returns on carabiners, ice screws, rigging hardware, ropes, etc (except for warranty or shipping errors).